Memory Box craft die featuring a Cottage Garden Gate. 100% steel craft die from Memory Box. For use on cardstock, felt, and fabric. Cut, stencil, emboss, create. Use in most leading die cut systems. Features an ornate wrought iron gate. This is a set of 2 dies. Each side measures 2 x 4 inches. 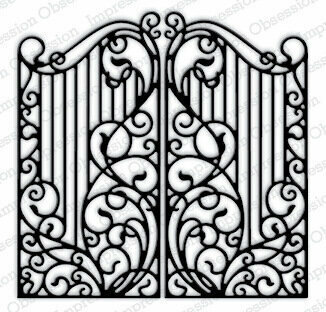 The Garden Gate die set contains 3 pieces: a wrought-iron fence section, a gate, and an arched arbor. Mix and match the pieces to create a gateway into your garden scene. The fence section measures approximately 1.25" x 1.75". The gate measures approximately 1.2" x 2.2". The arbor piece measures approximately 1.7" x 2.375". Our Frantic Stamper Precision Dies work in most consumer table top die cutting machines. Some dies may require the use of a metal shim depending on your machine. Designed by Sue Wilson these cutting dies are an elegant collection of high quality steel designed to co-ordinate with each other. Contains 1 die. Size: 4.0" x 5.0". 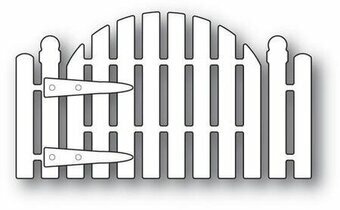 Complete a welcoming A Tweet Hello garden scene with a beautiful and intricate fence created with the Garden Gate Die-namics. Garden Gate will complement a wide assortment of designs in your collection or serve as a striking focal point for a more clean and simple design. The Garden Gate Die-namics measures 3 9/16" x 3 1/16". MFT Die-namics, our very own exclusive American-made line of steel dies. Die-namics dies work with your favorite die-cutting machine. Adding embellishments that are sure to bring a touch of charm and whimsy to garden themed projects is easily achieved with the Wildwood Cottage Accents Die. When paired with the coordinating cling stamp illustrations, the miniature birdbaths, tiny wheelbarrows, diminutive gates, and of course cobblestone paths hidden beneath tall grass and wildflowers will bring a sense of wide-eyed wonder to all those who gaze upon your creations! The perfect dimensional elements to add a realistic look to your pixie gardens! These dies are part of the Wildwood Cottage Collection and pair with the Wildwood Cottage Accents Cling Stamp Set. Approximate Image Sizes: 1. Floral Stem: 1.5" x 1.5", 2. Wheelbarrow: 1.75" x 1.0", 3. Birdbath: 1.0" x 1.75", 4. Cobblestone Path: 3.25" x 1.25", 5. Tall Grass: 3.0" x 1.0", 6. Arched Gate: 1.75" x 2.0", 7. Fence: 2.25" x 1.25". Sue Wilson -Finishing Touches - Wooden Gate and Fence. Designed by Sue Wilson these cutting dies are an elegant collection of high quality steel designed to co-ordinate with each other. 4 dies. Sizes: Smallest: 0.25" x 0.25", Largest: 3.25" x 0.70".